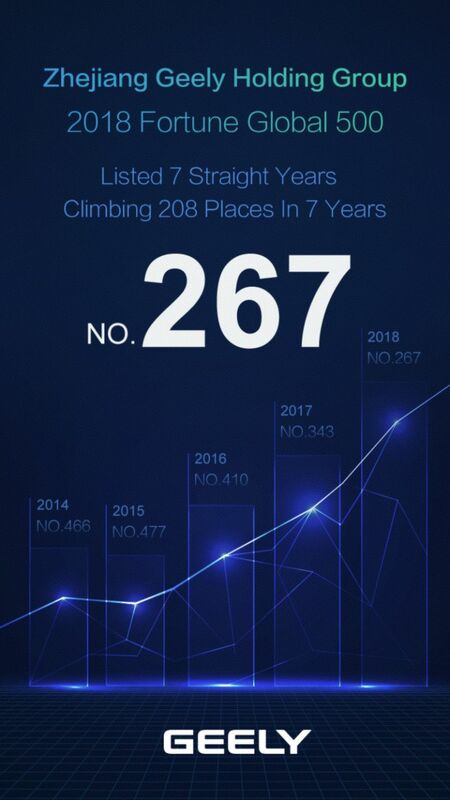 Geely Holding rises 76 places to 267th in 2018 Fortune Global 500. Geely Holding listed on Fortune Global 500 for seventh consecutive year. ZHEJIANG Geely Holding Group (Geely Holding), China’s largest privately-owned automotive technology company, rose 76 places in the 2018 Fortune Global 500 to 267th after revenues last year reached US$41.1 billion. The ranking marks the seventh consecutive year that the Group has featured in the Fortune Global 500. Geely Holding marked its latest Fortune 500 ranking by issuing the following summary of its progress from the past year. Geely Holding achieved extremely strong results in 2017 due to record sales at the Group’s core subsidiaries: Geely Auto of China and Volvo Cars, the iconic Swedish automotive group. 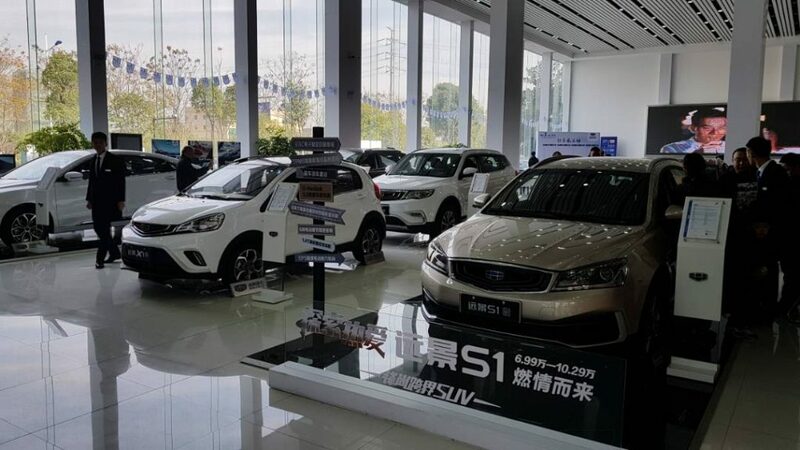 Geely Auto sold more than 1.24 million vehicles in 2017, a 63% increase year-on-year, while unit sales at Volvo rose 7% to 571,577 vehicles. During the first half of 2018, Geely Holding has continued to grow strongly. In the six months to June 30, Geely Auto sales reached 766,630 vehicles, a 45% YoY increase. Volvo Cars saw significant growth on the back of its award-winning XC40, XC60 and XC90 models with sales reaching 317,639 vehicles, a 14.4% YoY increase. Unit sales in China, Volvo’s largest single market grew by 18.4% to 61,480 vehicles. And this year has seen Volvo awarded several prestigious accolades including European Car of Year for their new XC40, World Car of the Year for their New XC60. Håkan Samuelsson, President and CEO of Volvo Cars, was named World Car Person of the Year in 2018 by the World Car of the Year Jury. Among other Geely Holding operations, the newly-introduced LYNK & CO brand, created for a new generation of automotive consumers in urban regions, has posted strong results since launching in December 2017 with total sales for the first half year reaching 46,252 units. LYNK & CO vehicles are based upon the Compact Modular Architecture (CMA) jointly developed by Volvo Cars and Geely Auto to underpin a new generation of compact vehicles. In the past year, Geely Holding has also completed several acquisitions which has expanded the Group’s global presence as part of its transformation from traditional automaker to a technology-driven mobility services group. In the last year, the Zhejiang Geely Holding Group group completed the acquisition of Terrafugia, the US flying car company, as well as a 51% controlling stake in Lotus, the iconic British sports car brand, and 49.9% stake of PROTON, the Malaysian car maker. The Group also made strategic investments in Saxo Bank of Denmark, in AB Volvo, the Swedish commercial vehicles group, and became the largest shareholder in Daimler AG, the German automotive group. Geely Holding’s growth in smart mobility has gained traction in the past year with the rapid expansion of CAOCAO, its new energy ride-hailing platform. The automotive group in China to enter the ride-hailing market after CAOCAO received its service license in early 2017. In just over a year, CAOCAO has expanded to 25 cities with more than 26,000 new energy vehicles in operation. Geely Holding reaffirmed its technology credentials with a foray into high-speed rail WiFi through a new joint-venture with Tencent and China Railway, forming part of its transition away from pure manufacturing into intelligent mobility services. During the past year, the Group increased its presence in new energy systems and technologies. LEVC, the Group’s taxi and commercial vehicles subsidiary, launched its electrified range-extended taxi, the E-City TX. Volvo Cars announced its commitment to fully electrify its vehicle range starting from 2019. Volvo’s performance car division, Polestar became a standalone fully electrified performance car brand with a new state-of-the-art factory being built in Chengdu. In the first half of this year, Geely Auto unveiled its new flagship hybrid sedan, the Bo Rui GE. It also released several new energy models with ranges up to 450km on a single charge, and made a pledge that by 2020, it will offer at least 30 new energy models.